Native American Facts For Kids was written for young people learning about the Yurok tribe for school or home-schooling reports. We encourage students and teachers to visit our main Yurok website for in-depth information about the tribe, but here are our answers to the questions we are most often asked by children, with Yurok pictures and links we believe are suitable for all ages. How do you pronounce the word "Yurok"? What does it mean? Yurok is pronounced "YOOR-ock." That means "downriver" in the Karok language. ("Karok" means "upriver.") The Yuroks themselves usually used village or clan names rather than a general tribal name (like early colonists who referred to themselves as Virginians or Carolinians rather than Americans.) But sometimes the Yurok called themselves Olekwo'l, "the people," or Pulikla, "downriver." Where do the Yuroks live? The Yuroks are original people of Northern California. Most Yurok people still live there today. How is the Yurok Indian nation organized? Most Yurok people live on a reservation in California, which belongs to the Yurok tribe and is under their control. The Yurok tribe has its own government, laws, police, and other services, just like a small country. Other Yuroks live on rancherias together with Wiyot, Hupa, Tolowa, and Maidu Indians. Rancherias are small parcels of land that California Indians have partial control over. In the past, each Yurok village was ruled by the wealthiest man in town. Today, since the rancherias are home to Indians from many different tribes, they are ruled by tribal councils which are elected by all the residents. What language do the Yuroks speak? The Yurok speak English today. Some older people also speak their native Yurok language. If you'd like to know an easy Yurok word, "Oyuukwi'" (pronounced o-yoo-kwee) is a friendly greeting. Here is a Yurok picture glossary you can look at. Today Yurok is an endangered language because most children aren't learning it anymore. However, some Yurok people are working to keep their language alive. What was Yurok culture like in the past? What is it like now? Here's a link to the Yurok Tribe's homepage. On their site you can find information about the Yurok people in the past and today. How do Yurok Indian children live? What games and toys do the Yuroks have? They do the same things any children do--play with each other, go to school and help around the house. Many Yurok children like to go hunting and fishing with their fathers. In the past, Indian kids had more chores and less time to play, just like colonial children. But they did have toys and games. One Yurok game was the stick game. Players held marked sticks behind their backs and gambled as they guessed the location of each stick. Another Yurok game is tossle, which is an athletic sport similar to lacrosse and rugby. Traditionally, only men and boys played tossle or the stick game. Yurok girls often played with dolls. Like many California Indians, Yurok mothers traditionally carried their babies in baby baskets on their backs. What were Yurok homes like in the past? The Yuroks lived in rectangular redwood-plank houses with pitched roofs and chimneys. Usually these buildings were large and an extended family lived in each one. 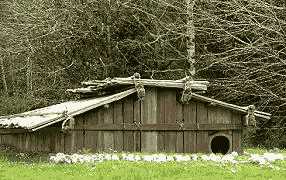 Here are some pictures of Native American homes like the ones Yurok Indians used. Today, most Yuroks live in modern houses and apartment buildings, just like you. What was Yurok clothing like? Did they wear feather headdresses and face paint? Yurok men didn't usually wear clothes, though they sometimes did wear short kilts. Yurok women wore long grass skirts decorated with shells and beads. Shirts were not necessary in the Yurok culture, but both men and women wore ponchos or deerskin robes in cool or rainy weather. The Yuroks wore sandals or moccasins on their feet and strands of shell necklaces around their necks. Here are some photos and links about Native American costume in general. The Yuroks didn't wear long headdresses like the Sioux. Yurok women wore woven basket caps, and men sometimes wore a deerskin headband. For special occasions, like a dance, Yurok warriors might wear a special headdress decorated with woodpecker scalps. The Yuroks didn't paint their faces, they did wear tribal tattoos. Women tattooed lines on their chins, and men tattooed their arms. Today, some Yurok people still wear moccasins or shell jewelry, but they wear modern clothes like jeans instead of kilts or grass skirts. What was Yurok transportation like in the days before cars? Did they paddle canoes? Yes--the Yurok tribe made dugout canoes by hollowing out redwood logs. A Yurok canoe could be more than thirty feet long. The Yurok tribe used canoes to travel up and down the Klamath River and the coast of California for trading, fishing and hunting. Here is a website with pictures of different Native boats. Canoeing is still popular among California Indians, though few people carve a dugout canoe by hand anymore. Today, of course, Yurok people also use cars... and non-native people also use canoes. What was Yurok food like in the days before supermarkets? The Yuroks were fishing people. Yurok men caught fish and mollusks from their canoes. They also hunted sea lions, deer, and small game. Yurok women gathered acorns and ground them into meal, as well as collecting seaweed, berries and roots. Here is a website with more information about Native food. What were Yurok weapons and tools like in the past? Yurok hunters used bows and arrows. Yurok fishermen used spears, nets, and wooden fish traps. The Yurok didn't go to war very often. They had a complicated legal system and sued each other when they felt wronged, like Americans do today. But occasionally Yurok men would fight duels with clubs (usually not to the death.) Here is a website of pictures and information about American Indian weapons. What are Yurok arts and crafts like? Yurok artists are known for their fine basketry and woodcarving arts. Here is a picture of a beautiful Yurok basket hat. What kinds of stories do the Yuroks tell? There are lots of traditional Yurok legends and fairy tales. Storytelling is very important to the Yurok Indian culture. Here is a story about how the foxes caught the sun. Here's a website where you can read more about Yurok myths. Religions are too complicated and culturally sensitive to describe appropriately in only a few simple sentences, and we strongly want to avoid misleading anybody. You can visit this site to learn more about Yurok religious ceremonies such as the Brush Dance and Jump Dance, or this site about Native American spirituality in general. If you want to know more about Yurok culture and history, two interesting sources for kids are Yurok Tribe and Yurok. Older readers may enjoy To The American Indian, an oral history by a Yurok author. Two good books for kids on California Indians in general are California Native Peoples and Native Ways; a more in-depth book for older readers is Tribes of California. You can also browse through our recommendations of Native American books in general. Thanks for your interest in the Yurok Indian people and their language! An overview of the Yurok tribe, their language and history. Yurok Indian language samples, articles, and indexed links. Related links about the Yurok Native Americans past and present.